Astaxanthin has been widely used in aquaculture industry for pigmentation of salmon, trout and shrimps; used for its antioxidant and other health benefits in nutraceutical industry; used in cosmetics for its skin care and anti-aging properties; and also used for fortification of foods and beverages. On commercial scale, astaxanthin is currently produced through chemical synthesis and also derived from natural sources such as Phaffia yeast, Paracoccus bacteria, shrimp bi-products and Haematococcus pluvialis (H. pluvialis) microalgae, with the current major natural source of astaxanthin being the Haematococcus pluvialis microalgae. In recent years, there has been a growing trend toward using natural ingredients in all forms of food nutrients including the nutraceutical and cosmetic markets, resulting from increasing concerns for consumer safety and regulatory issues over the introduction of synthetic chemicals into the human food chain. The demand for natural astaxanthin derived from Haematococcus pluvialis algae in the global market has been 'sky-rocketing' in recent years owing to increasing consumer awareness of its health benefits. Global market for both synthetic and natural source astaxanthin in aqua feed, nutraceuticals, cosmetics and food & beverages is estimated at 280 metric tons valued at US$447 million in 2014, is further projected to reach 670 metric tons valued at US$1.1 billion by 2020. Synthetic astaxanthin, astaxanthin rich Phaffia yeast and Paracoccus bacteria are predominantly used in the aquaculture sector, while the astaxanthin derived from H. pluvialis microalgae is the main source for human applications such as dietary supplements, cosmetics and food & beverages. Astaxanthin products analyzed in this study include Synthetic Astaxanthin, Haematococcus pluvialis Microalgae Astaxanthin and astaxanthin rich Paracoccus bacteria. 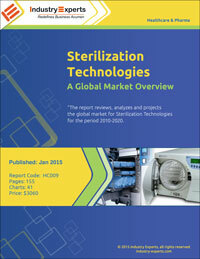 End-use application markets covered in the report are Aqua Feed, Nutraceuticals, Cosmetics and Food & Beverages. The report reviews, analyses and projects the astaxanthin market for global and the regional markets including North America, South America, Europe, Japan, Asia-Pacific (excluding Japan) and Rest of World. The report also provides a special focus on various astaxanthin production technologies employed by key market players, including Chemical Synthesis; Microalgae Cultivation, Harvesting, Drying and Astaxanthin Extraction; and Bacteria Fermentation. 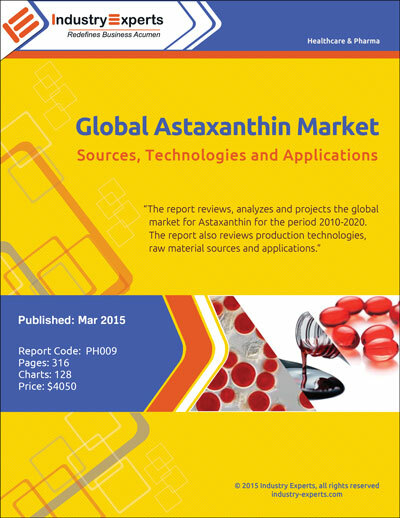 The 316 page global astaxanthin market report includes 128 charts (includes a data table and graphical representation for each chart), supported with meaningful and easy to understand graphical presentation, of market numbers. 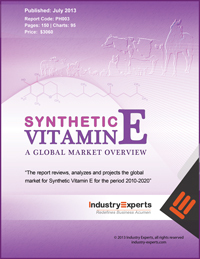 This report profiles 46 key market players segmented by synthetic Astaxanthin manufacturers – 5; natural source Astaxanthin manufacturers including new entrants – 41. 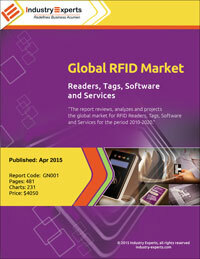 In addition, the report provides the list of key market players that comprises contact numbers, websites and addresses. 6. Atacama Bio Natural Products S.A.
4. Yunnan Alphy Biotech Co.,Ltd. Table 15: Composition of Growth Medium for Haematococcus. 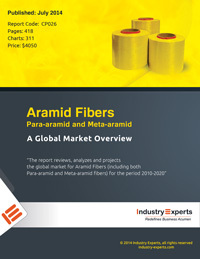 Latest version of this report is available. Click below to view report.